Product #21822 | SKU Z-S7R-V2 | 0.0 (no ratings yet) Thanks for your rating! 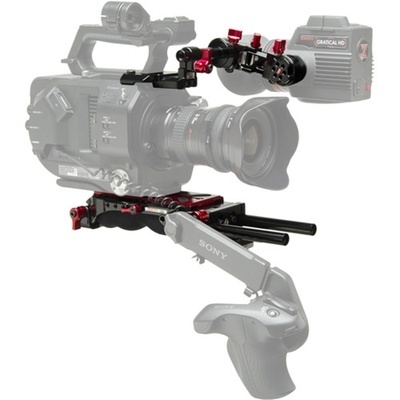 The Sony FS7 Recoil shoulder-mounted rig includes our VCT Pro baseplate and our Axis Mini for Sony FS7 and FS7 II cameras which can be used with either the Gratical EVFs or the Sony monitor. Relocate the Sony camera grip to the side of the VCT Pro via M6 Rosette for optimal usability and comfort. VCT Pro Baseplate – this baseplate has a sliding top plate for quickly removing the camera from the rig or fast len changes, a built-in, curved shoulder pad, a v-wedge tripod connector (with ¼” 20 and 3/8" 16 screw option). It has removable and extendable 6.5” iris rods and rows of ¼” 20 screw holes along the sides for accessories. It has quick release 15mm rod parts in the rear. The recessed rod mount offers maximum accessory capable space under your camera lens. Axis Mini for Sony FS7 – Attaches to the 15mm rod on the Sony FS7 Top Handle to mount either a rosette mounted EVF like the Gratical HD or the Sony monitor itself. Adjustable positioning for shoulder mounted shooting or tripod shooting.